The best of both worlds is available in this beautiful beach house with vaulted ceilings, located just 200 feet from the beaches and ocean. Relax and enjoy the ocean views from the huge decks on the front and back of the house. Or indulge in the amenities of the Ocean Lakes resort community. Our beach house is fully furnished with everything you'll need (except towels and linens, hand and bath soap, and paper products) for a carefree vacation at the largest full-service resort on the eastern seaboard. Our three-bedroom/two-bath home has one king-size bed, one queen-size bed, one double, one single, to sleep up to seven people. The resort offers an Olympic-size outdoor swimming pool, two kiddie pools, tanning decks, huge water slide, skate park, and a heated indoor pool. We do have three other sites (1114, 1162 and 1063) also available to meet any needs from 2 bedroom to 6 bedroom, so please ask us! There's a huge oceanfront observation deck, snack shops, a convenience store, three playgrounds, a marine life nature center, eight freshwater fishing lakes, a 17,000 square-foot recreation center, an arcade, miniature golfing, basketball courts, horseshoes, shuffleboard, bingo, golf carts, paddle boats, and bicycle rentals -- all located in a 300-acre facility with an entire mile of private beach. And with 24-hour security within this gated resort community, this will be your most enjoyable vacation ever! If 'hittin' the town' is in order, we are only minutes from all of Myrtle Beach's major attractions such as Broadway at the Beach, Hard Rock Cafe, Planet Hollywood, NASCAR Cafe, NASCAR Speedpark, Ripley's Aquarium, an IMAX Theater, Dixie Stampede, House Of Blues, The Palace Theater, Legends In Concert, Medieval Times Dinner and Tournament, The Carolina Opry, The Gatlin Brothers Theater, and several huge shopping attractions and outlet malls. If outdoor entertainment is your choice, there is golfing on over 100 courses, charter fishing, parasailing, jet-skiing, salt marsh cruises, and gambling boat cruises available. Bring your family and friends and enjoy all that Myrtle Beach has to offer. Just on the edge between Myrtle Beach and Surfside Beach in the Ocean Lakes resort. Come enjoy all of the amenities of Ocean Lakes while staying in your private beach house (site 1113) located only 200 feet from the beach. 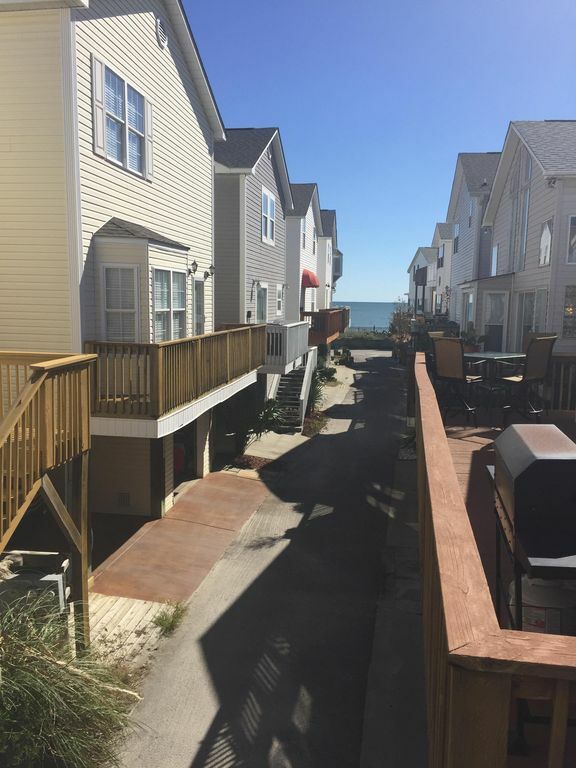 A great location to enjoy all of what Myrlte Beach and the Grand Strand has to offer. Great house! The location was so close to the beach! Everything was as described. Loved sitting on the deck! Only thing it could use is a little roof over the steps and the back door because it poured while we were there and the carpet got really wet every time we opened the door. Other than that the house was great! The owners were wonderful, House was clean and well stocked. We will be back! Love Ocean Lakes, great vacation, house was basic, served the purpose. We had a wonderful time, the house was clean and close to the beach. A little dated, the WiFi was slow, but upon request was given a different login that worked. The queen bed definitely needed replaced, as well as the stove, which only had 2 working burners. The washer and dryer was fantastic! Also only had basic cable, which was disappointing. Could use new deck , deck furniture, and at least a partial deck roof, but see the place is for sell so maybe the new owners will update. It was very nice. The house was great and very clean and there was plenty to do with the kids. It was very clean and well kept. We definitely will be staying with them again. My family spent a week at the house and enjoyed every minute. Perfect location by the beach, inside of a fun community! The house is great! loved that we were able to take our beagle with us. This was our 3rd year staying in this beach house and can't wait to book again for next year.